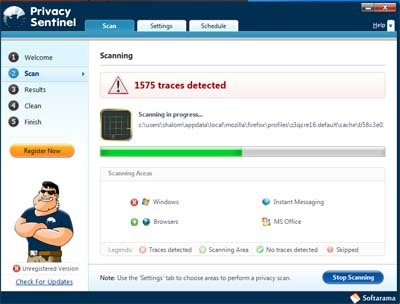 Privacy Sentinel is an award winning application that keeps your system clean and prevents sensitive data from being retrieved by hackers or spyware. While you browse around, data from websites you visit is automatically stored on or recorded in hidden Windows locations such as temporary files, cookies, system registry and the index.dat file. It conceals or eliminates sensitive info according to its importance to ensure your online privacy. ...... Privacy Sentinel conceals or eliminates sensitive info according to its importance to ensure your online privacy. * History, cache, cookies and temp files. * Eliminates sensitive messenger, windows and MS office traces. * Protects your sensitive information. Qweas is providing links to Privacy Sentinel 1.0.08 as a courtesy, and makes no representations regarding Privacy Sentinel or any other applications or any information related thereto. Any questions, complaints or claims regarding this application Privacy Sentinel 1.0.08 must be directed to the appropriate software vendor. You may click the publisher link of Privacy Sentinel on the top of this page to get more details about the vendor.